Bird’s eye views fascinate us because they give us a panoramic, perspective view of a landscape as if we were seeing it with our own eyes. Typically, such views are of cityscapes or relatively small areas but with some cartographic license we can turn our skills to the depiction of much larger areas. This chromolithographic print, published by G. W. Bacon captures an entire country using the technique. It’s neither perfectly planimetric nor uses a progressive projection but there are subtle changes in the perspective from south to north, accentuated by the depiction of landforms throughout. The content is fairly routine in terms of topography with roads, rivers, towns and cities as well as major mountains, rivers and some political and administrative features. 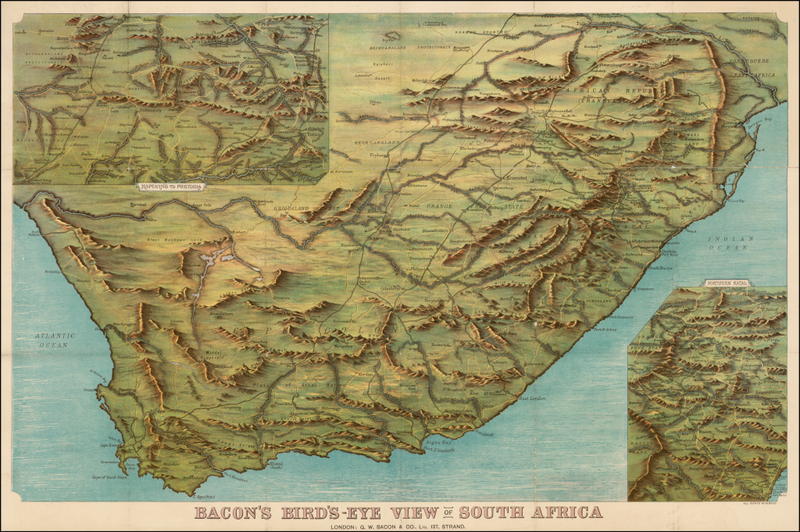 Insets are used to show the Transvaal in the upper left and northern Natal in the lower right giving the layout balance as well as space for more detail in these areas. 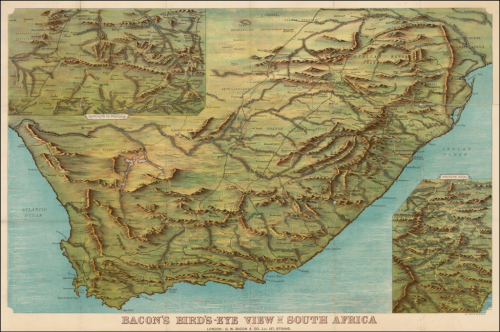 Of course, timing is everything in cartography and the map was was published just after the First Boer War (1880-1) and in the period leading to the Second Boer War (1899-1902). The British were particularly keen to understand the landscape and names which were becoming part of daily life in newspapers. Maps such as this helped contextualize the far off land and better appreciate the places which had, by now, been discovered to hold large gold and diamond reserves. 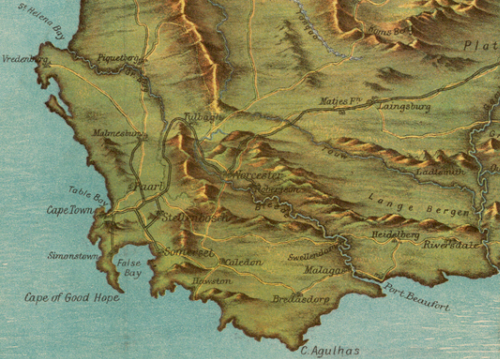 More than all of this, the map is well coloured and pleasing as a form of cartographic art. The mountains, in particular, are depicted using a plan oblique technique and sit well amongst the otherwise flat plains. The use of light across the image hints at the way sunlight might hit a picture with the south being slightly darker than the north, particularly around the inset. The same is true for the rendering of the water and around the lower right inset. This gives the work added depth. This entry was posted in MapCarte and tagged historical, MapCarte, pictorial, relief by @kennethfield. Bookmark the permalink.